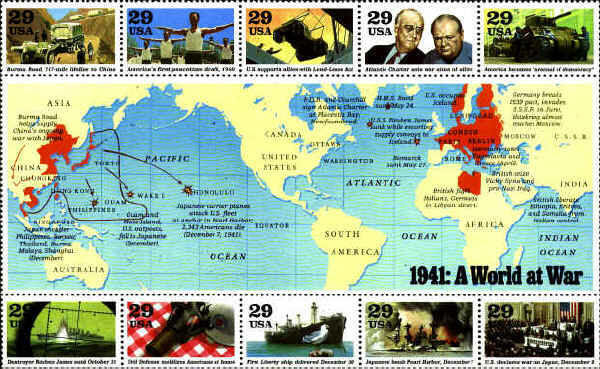 Designs and events of World War II in 1941. 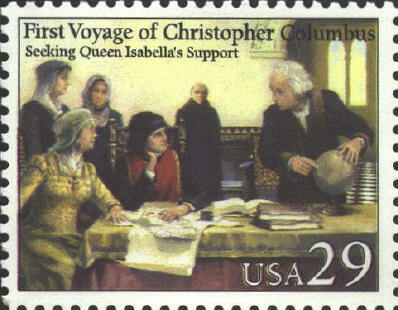 Both stamps below show Columbus at a table with a map and a globe. The only known globe in existence in the 1490's was that made by Martin Behaim, and it was in Nuremberg. 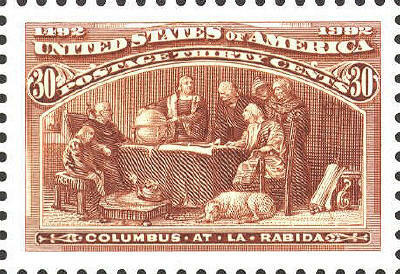 The first stamp is based on the painting, Columbus Before the Franciscans at La Rabida by Felipe Maso de Falp (1851-1929). It is a reproduction of US 239. In 1486 Columbus was granted an audience with the Spanish monarchs, Ferdinand and Isabella, at Cordoba. Juan Rodriguez Cabrillo arrived in Cuba in 1520 and served with Hernan Cortez in the conquest of the Aztecs. He was ordered to explore the Pacific coast North from Mexico. He discovered San Diego Bay, Santa Monica Bay, the Santa Lucia Mountains and Monterey Bay, but he missed San Francisco Bay. He landed at San Diego in 1542, the first European to set foot on the western coast of the United States. He died on San Miguel Island in 1543. The map in the background depicts the entrance to San Diego Bay flanked by the Point Loma and Coronado peninsulas. 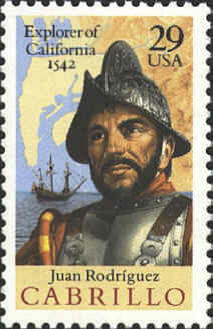 There is no known picture of Cabrillo, so the picture on the stamp is a typical Spanish conquistador of the 16th century.